More than one-third of children and adolescents in the U.S. is overweight or obese. In Miami, more than 40 percent of young children are overweight or obese with most parents not being aware of their child’s current health status. Children who are overweight are more likely to be at risk for future health problems, peer difficulties and mental health issues that can lead to problem behaviors, which can also interfere with learning. Adopting healthier eating habits and staying active can help improve children’s academic achievement and lower the risk for obesity and related diseases. However, making healthy lifestyle choices can be challenging for parents, especially if a child is a picky eater. With summer vacation around the corner, psychologist Paulo Graziano offers some tips for parents and their children on how to stay healthy over the summer. Discuss what it means to be healthy. Parents should engage in conversations with their children that explain that being healthy requires proper exercise and a well-balanced diet. Reduce screen time. Parents should try to reduce the amount of hours spent in front of screens (iPads, TVs, computers, etc.). Although there are many educational programs, it is important to not exceed two hours per day on these devices. Eat dinner as a family. Rather than preparing different dishes for every member in the family, caretakers are encouraged to create one healthy dish that everyone will eat. This can help model the positive eating behaviors you want your children to engage in. Sweat is good for you! Make sure to engage in physical activity with your child that involves getting sweaty. The best physical activities will leave your child’s hairline wet and include both the child and parent in the activity. 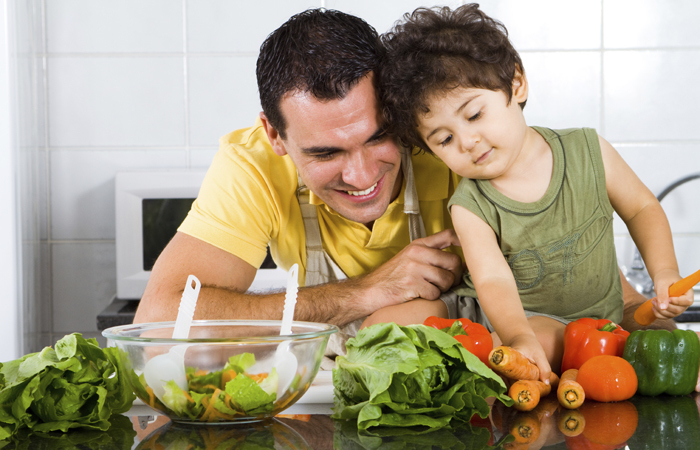 Let your child pick which healthy food is on their plate. When caretakers are purchasing groceries, allow children to pick out the fruits and vegetables they are willing to try. Children are more likely to eat foods they pick out, rather than foods they are forced to eat. Make it a family effort. If you want your child to pick up healthier habits, encourage your family to be supportive and start making healthier habits themselves. It can encourage the child to pick up these habits sooner if they realize everyone in their family is supportive and making the same choices. Provide praise. It is incredibly important to tell children that their efforts are appreciated. Any and all attempts at trying new foods should be celebrated. Providing positive feedback about their willingness to try the food will increase the chances of them trying it again. Helpful resources. Resources like USDA’s ChooseMyPlate.gov provide families with a variety of tips and suggestions on how to promote healthy habits at home. ChooseMyPlate also has guides for plates with the correct portions for children and adults. These plates can help parents monitor how much their children are eating and what is recommended for children according to their age. Keep it natural. When choosing snacks, make sure to keep it simple. A bag of fruits and vegetables will be healthier and provide more natural energy than any other snack. Also, try to reduce the amount of juice and milk your children consume. Water is the most beneficial and healthiest drink you can offer your child. Graziano is the director of the Healthy Lifestyle Intervention Program (HIP) at FIU’s Center for Children and Families. Modeled after the center’s award-winning Summer Treatment Program, HIP encourages children to adopt healthier eating habits and enjoy being active while improving their ability to focus and follow classroom rules and routines. The program is designed as a behavioral family intervention, teaching parents skills to help create a healthy environment for all members of their household. Enrollment for this summer’s program is underway. For more information, call 305-348-0477.